Manhattan District Attorney Cyrus R. Vance, Jr., today announced the indictment of STEFANY HERNANDEZ, 25, a former home health aide, for stealing more than $260,000 from the 98-year-old woman she previously cared for on the Upper East Side. The defendant is charged in a New York State Supreme Court indictment with Grand Larceny in the Second Degree. According to court documents and statements made on the record in court, between the fall of 2012 and August 2014, HERNANDEZ worked in the home of a 98-year-old woman and her now-deceased husband on East 68th Street. From February 12, 2014, to March 26, 2015, the defendant stole more than $260,000 from the elderly woman by depositing and cashing forged checks from two of the victim’s checking accounts. During the time period charged in the indictment, HERNANDEZ deposited or cashed 102 forged checks made payable to her. Thirty-three of those checks were written after August 2014, when HERNANDEZ was no longer employed by the couple. HERNANDEZ spent the money on personal expenses, including more than $35,000 in personal credit card payments, more than $18,000 on clothing and accessories from stores like Bloomingdales and Barneys, and approximately $12,000 on airfare and hotels, including flights to Miami and the Dominican Republic. The defendant also withdrew more than $100,000 in cash. By June 2015, HERNANDEZ had withdrawn all of the stolen funds from her bank account. 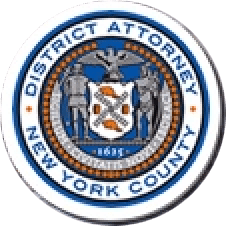 After the victim’s husband passed away at the age of 100 in January 2015, the victim’s son and daughter-in-law discovered the alleged larceny while reviewing financial records and reported it to the Manhattan District Attorney’s Office. Assistant District Attorney Laura Wexler is handling the prosecution of this case under the supervision of Assistant District Attorneys Catherine Christian, Chief of the Elder Abuse Unit; Gloria Garcia, Deputy Chief of the Financial Frauds Bureau; Archana Rao, Principal Deputy Chief of the Financial Frauds Bureau; Michael Sachs, Chief of the Financial Frauds Bureau; and Executive Assistant District Attorney David Szuchman, Chief of the Investigation Division. Elder Abuse Unit Coordinator Melanie Chan, Financial Investigator Miriam Bouchma, Investigative Analyst Lauren Gunther and Detective Simon Chan of the Detective Squad of the New York City Police Department at the Manhattan District Attorney’s Office also assisted with the case.